Pi Zero Case Vented and Hinged Remix for adding OLED #3DPrinting #3DThursday « Adafruit Industries – Makers, hackers, artists, designers and engineers! GeoDave shared this project on Thingiverse! I made the https://learn.adafruit.com/pi-hole-ad-blocker-with-pi-zero-w/project-parts project & wanted a case with just the OLED showing on top. After looking at different case ideas, I liked this hinged case for Pi Zero https://www.thingiverse.com/thing:1954625 . 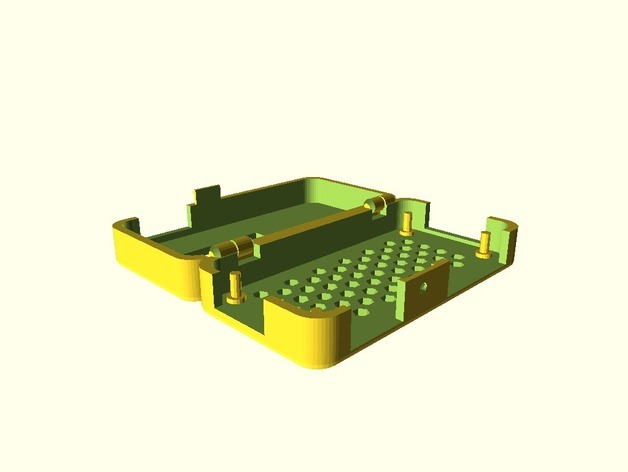 I recreated the design in openscad to make it easier for me to change some things.